Have you ever wondered what it was like to be in the mind frame of someone who suffers from anxiety? This book depicts if fairly perfectly. I was amazed at how well it pinpointed that feeling… frustration, fear, and disappointment in yourself. So, if you need to be more sensitive and don’t understand what it’s like to live with it… this book is one you must read! Aside from that, it’s a fairly easy and adorable read, nothing too heavy in my opinion. It surrounds the difficulties of change, of stepping outside of a comfort zone and growing up. More than that it all takes place at a comic con! These type of stories seem to be big right now, about bloggers like you and me, fangirling because it’s what we do, and meeting people who are like us and teaches us that heeey it’s okay to be a nerd, it’s definitely okay to be different, too. The characters in this book were relatable, the plot was ehh decent enough, but for me, it was just an average read. Something I could zoom through, something that was light to break up my heavier reads and bit of a slump. Would I rave about it? Likely not, but would I recommend it to someone who is struggling with their anxiety, or struggling to understand it? Definitely! 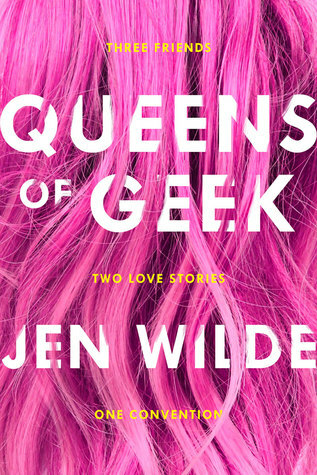 Do you have a favorite fangirl book? Share!